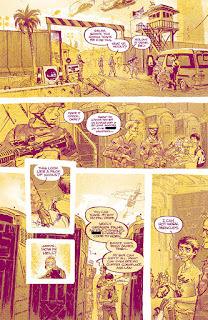 A site for links and information about graphic novels for anyone interested in reading them. I hope that you find my posts informative, useful, or entertaining. Thanks for stopping by! In this fourth book in the Secret Coders series (I reviewed books 1 & 2 here), the trio of programmers at Stately Academy, Hopper, Eni, and Josh, find themselves in even more ramped up situations. In the last book, they learned about the secret history of the school and found out that the source of their woes was the evil genius Professor One-Zero. Now, not only is the evil Professor changing the school schedule to further his evil schemes, but the school administration tries to break up the group so they can't foil any more plans. And the avenue for doing so is going through each of their families! Not only does this book feature one of the more realistic parent-teacher meetings I have read, it also has a revelation that one of the characters who has been around since the beginning is actually from another dimension. That, coupled with the trio's getting to know the Turtle of Light (the most powerful turtle in the world), raises the stake on their investigations. So, simply put, there is a lot of dramatic build-up here that I think will get paid off in Book 5 (due out next year). I have two caveats about this book, as well put together and interesting as it is: 1. It really helps to have read this series from the beginning, so this book is not a great jumping on point for a new reader. 2. The sections where they explain the specifics of coding still bogged me down some and took me out of the story. I know that those parts are necessary for solving the puzzles and moving the plot forward, but they are just a bit slow. This book is a continuation of the collaboration between Gene Yang and Mike Holmes. 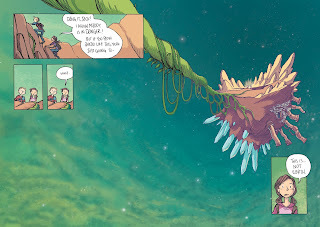 Yang is one of the premier comics creators working today. He was awarded a MacArthur Fellowship and is currently the National Ambassador for Young People's Literature. 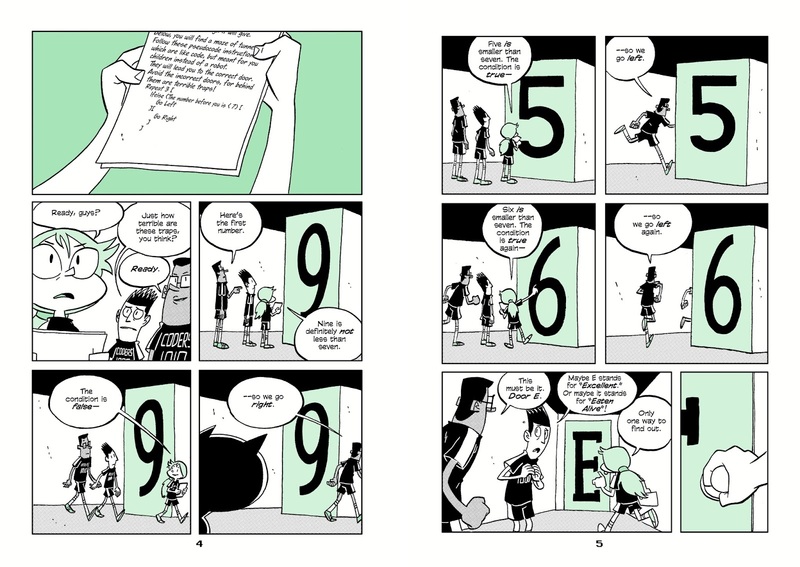 He also won the Printz Award for his graphic novel American Born Chinese. He explores themes of immigration, belief, identity, and growing up in his many works, including The Eternal Smile, Level Up, The Shadow Hero, the twin volumes Boxers & Saints, and his current run on New Superman. 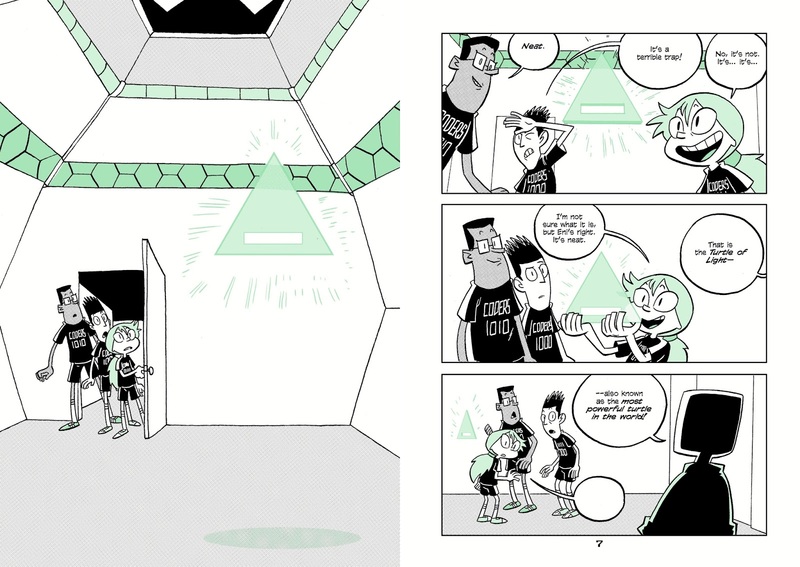 Holmes is best known for his work on the weekly comic True Story and drawing Adventure Time comics. The reviews I have read about this book have been mixed. 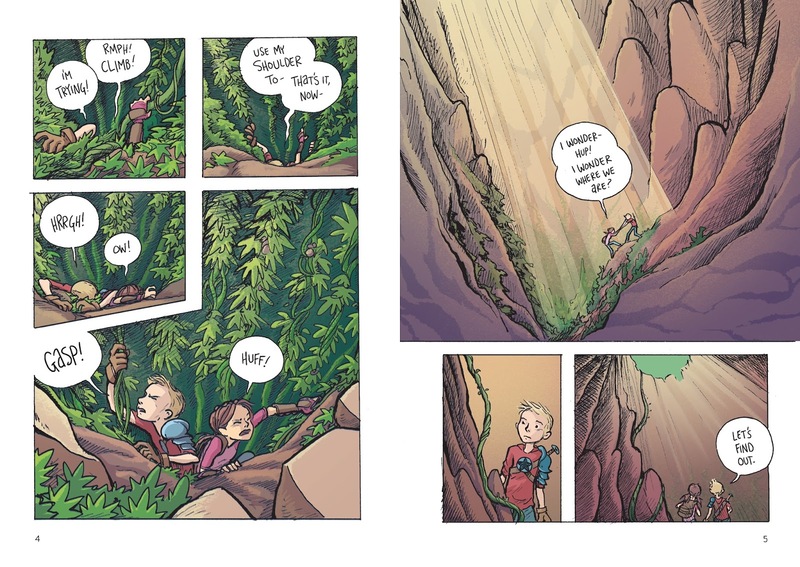 Kirkus Review complimented it, writing, "Yang’s integration of coding concepts into an actual mystery plot even as he continues to deepen character development in under 100 graphic pages looks effortless; Holmes’ panels continue to visualize those concepts inventively." Conversely, Dustin Cabeal wrote that this will be the last book in the series he will read, because "the teaching moments are breaking the story too often, and it feels like the experiment here was to have both be interesting and work together. They’re not and haven’t been which is a shame." For further contrast, more reviews for the book can be seen at Goodreads, where it currently has a 3.5 star rating. 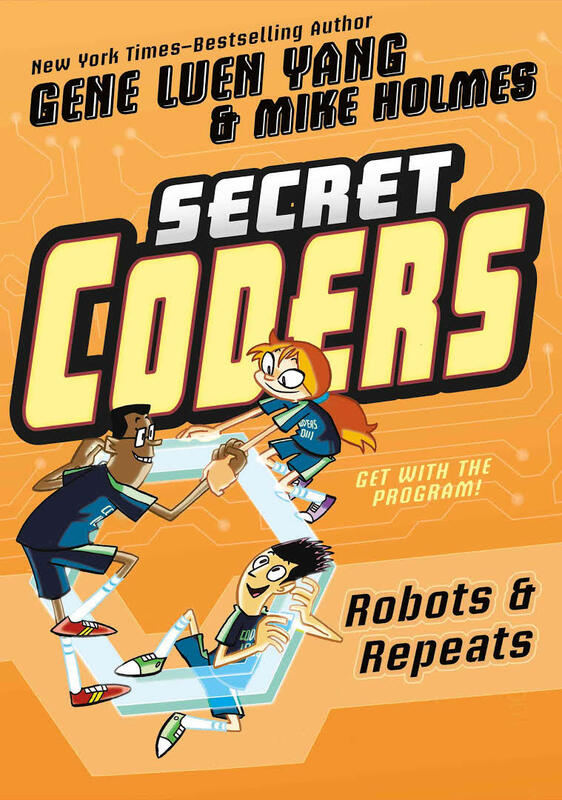 Robots and Repeats was published by First Second, and they provide a preview and more here. This series also has its own dedicated website with videos, info about all the books, and downloadable activities. Originally a limited series published about 10 years ago, but not finished, Loose Ends was re-published as a 4-issue limited series earlier this year. It is subtitled "A Southern Crime Romance," perhaps to associate this work with the writer's more famous work Southern Bastards.Out of those three descriptors, the one that stood out the most for me was "Crime." 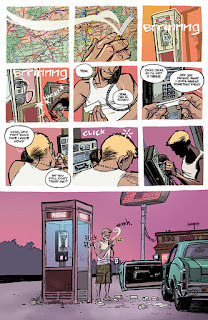 As you can see from the opening vignette, the protagonist Sonny is a drug-runner. Here he decides to take a detour to pay off an old debt, settling up with his ex with a good chunk of change for raising their son. Of course, things go south in an unexpected way, setting off a chain of events where Sonny ends up on the lam with a voluptuous woman named Cheri. He does not realize it at first, but she is an acquaintance from his adolescence. Together, the two share a kind of romance, though it's more like the best thing two desperate people can do to stave off loneliness, despair, and poor choices. In these, we are privy to what went on during the tortured duo's high school years. We also see Sonny's days as a soldier in Afghanistan as well as the pivotal moments when he turned to crime. This book is ambitious in that it tackles a great many social issues wrapped up in a pretty violent, compelling crime drama. I won't way that it sticks the landing in every case, but it is a good read, and a book I plan to revisit. The action is intense, and the drawings and colors are electric and spectacular. 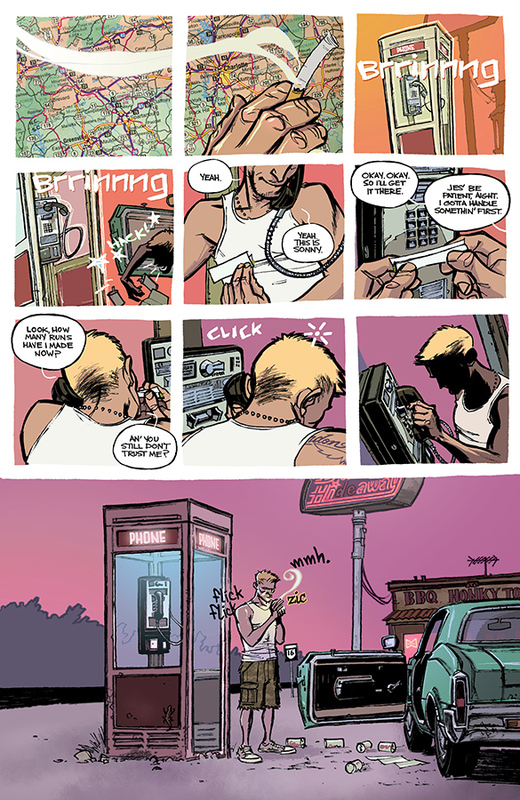 Loose Ends is a long-term collaboration between writer Jason Latour, artist Chris Brunner, and colorist Rico Renzi. Latour is more known for his artwork on the Eisner and Harvey Award winning series Southern Bastards as well as for writing Spider-Gwen. 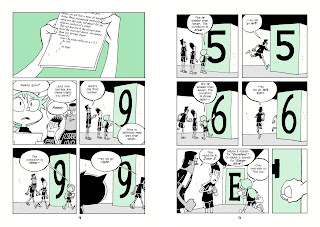 Brunner has drawn a bunch of comics, usually working with Latour and Renzi. Renzi colors lots of comics, including Spider-Gwen and The Unbeatable Squirrel Girl. Latour and Brunner both speak about their work on this series in this interview. The reviews I have read of this book have been pretty mixed, except for the universal praise for the artwork. AJ Zender called it "a visually and intellectually beautiful story that captures the extreme highs and lows of Sonny Gibson’s life." Daniel Vlasaty had a more tempered response, writing that it "felt some important pieces to the story were left underdeveloped, and just dropped into our laps without much explanation or follow-through." Jason Segarra concluded that it was "high on visuals, but a little rushed as a story." 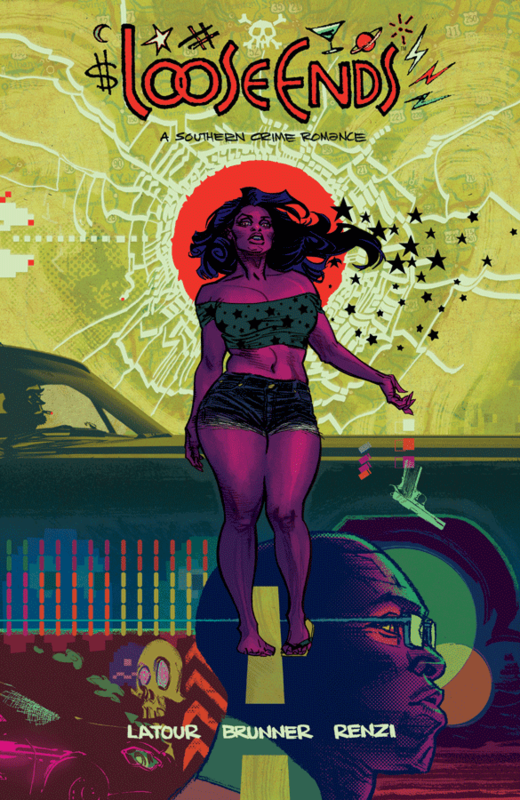 Loose Ends was published by Image Comics, and they have previews and more available about it here. Because of violence, sexual situations, and profanity, I suggest this book for more mature readers. This book is another one I am kicking myself for not reading years ago when I first got it. Luckily, one of the students in my Graphic Novels and Multiliteracies seminar chose it for our weekly read, and not only did I get to experience it but will get to discuss it, too. Put simply, Through the Woods is a collection of five gorgeous, horrible, and chilling stories. 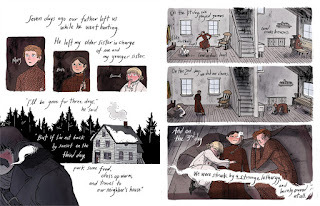 These stories are reminiscent of classic, gothic horror tales a la the Brothers Grimm. They feature dark strangers, wintry settings, isolated families, envy, loneliness, ghouls, mysterious manors, and labyrinthine forests. Also, they are all master classes in pacing, revelation, and building suspense. 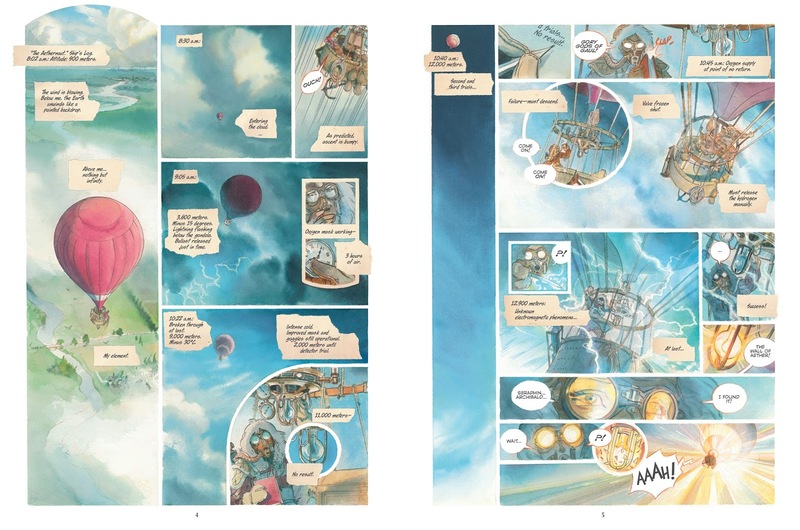 Everything in this book, the artwork, the poetic text, the character designs, and the layouts, contributes to beautifully rendered stories, an atmosphere of dread, interesting characterizations, and scenes of pure fantasy and amazement. I am not even going to go into detail about the separate stories, because I think a reader should get to experience them for themselves to get the optimal impact. I cannot heap enough praises on this book. It blew me away. Seriously, you need to buy or borrow this book RIGHT NOW. 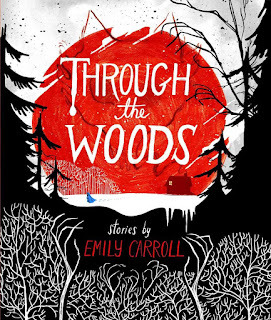 This book's creator is Emily Carroll, who won multiple awards for this debut, including two Eisners and an Ignatz. She publishes much of her work online and has a good number of her stories available to read online at her website. They are well worth checking out. She talks extensively about her work and career in this interview. The reviews I have read of this book have been glowing. Amal El-Mohtar called it "stunningly beautiful" and "magnificently executed." 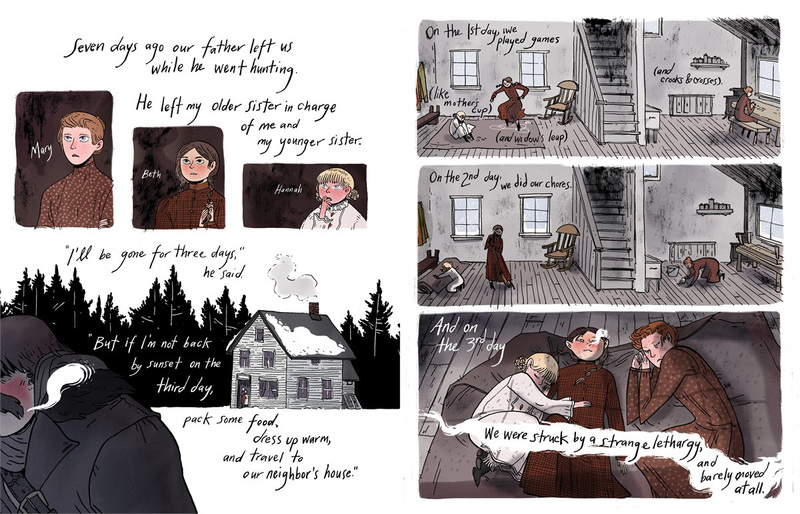 Sarah Horrocks wrote, "There is also a poetry to Carroll’s written word that you rarely get in western comics." Kirkus Reviews gave it a starred review and summed up, "A sure winner for any reader with a yen to become permanently terrified. Brilliant." 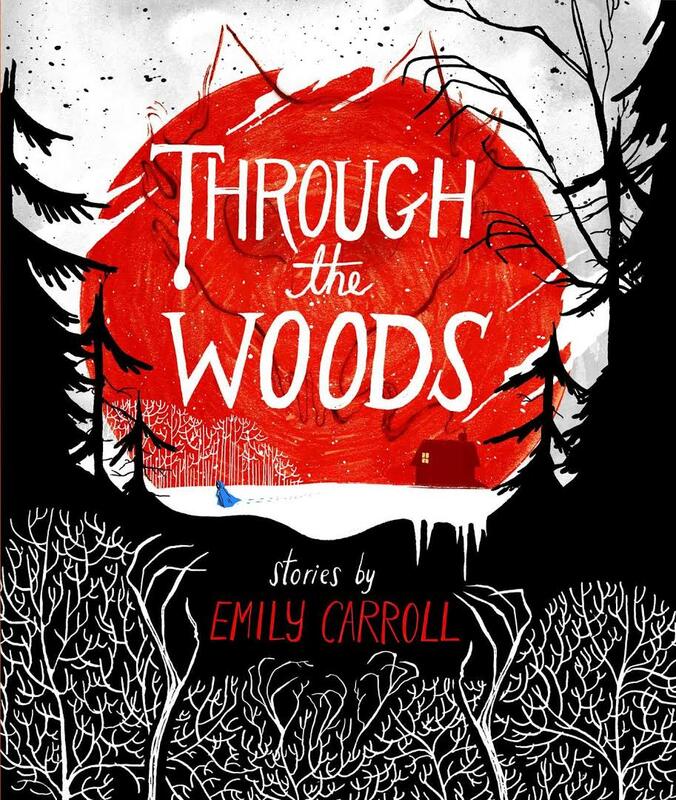 Through the Woods was published by Simon & Schuster, and they have a preview and more info about it here. 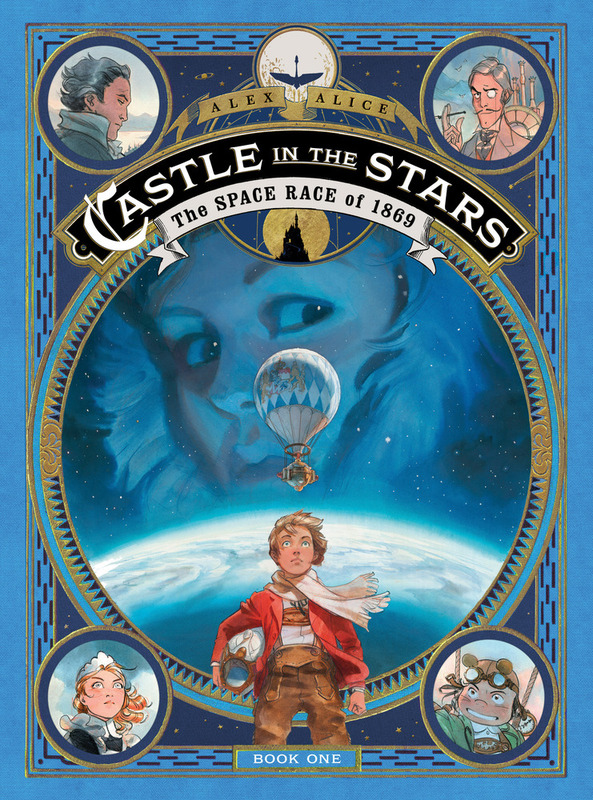 Castle in the Stars is an all ages science fiction/steampunk tale that looks and feels like a fairy tale. It has something for everyone: A brave woman who pushes the bounds of science and discovery, seemingly losing her husband and son in the process. Shifty Prussian spies who seek to kidnap people. Hot air balloons powered by a supernaturally powerful fuel. A castle. A Bavarian king under siege. A band of crafty children who are up to mischief. Gorgeously painted imagery (just check out that preview). After the events in the excerpt, things shift a year into the future where Seraphin and his father Archibald still wonder what happened to Claire. Archibald is upset that his son will not let go of his mother's seemingly crazy scientific ideas. But some unwanted, unsavory visitors come on the scene to indicate that perhaps she was not so off-the mark in her search for aether after all. What happens next takes father and son far away to a wonderful castle where they strive to complete her research and find out what really happened to her. This story is complex yet easily grasped, and it is one of those rare ones that I feel is entertaining to a wide variety of ages from the very young to adults. The artwork plays a very large part in my recommendation, as it is a colorful and lush feast for the eyes. The larger format of the book is apt for admiring and revisiting these sumptuous images. This book contains the first three chapters of a series originally published in France. Its author Alex Alice also has a number of other works, including a trilogy based on the opera Siegfried, available in English. His blog has not been updated in a while, but you can learn more about him at his entry at the Lambiek Comiclopedia. All of the reviews I have read sing this book's praises. Kirkus Reviews gave it a starred review, concluding, "Like the best steampunk, this story is one excellent distraction after another, with enough blueprints to hold people’s attention while they’re waiting for Book 2." Publishers Weekly summed up, "Lushly painted scenes, an abundance of banter among the young heroes, and plenty of action and gadgetry make for an engrossing tale of discovery and betrayal." Todd Young wrote, "The art and creativeness of the story make it a book I would recommend to anyone, regardless of age." Kelly Fineman called it "Perfect for folks interested in history, alternate history, steampunk, space exploration, science, and adventure." 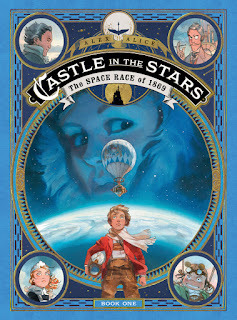 Castle in the Stars was published by First Second, and they offer a preview and much more here. A preview copy was provided by the publisher. This just in: Comics creator Sam Bosma, who is also known for his work as an artist on the cartoon show Steven Universe, has created another masterful graphic novel in the Fantasy Sports series. Fans of this blog might have realized by now that I am in love with these books (please see reviews for books 1 and 2). In this third book, they wash upon an island where a great beast has taken control. And there is a change of pace, narratively speaking, as the duo gets separated. Left to her own devices, Wiz gets to take part in a lot more action, embroiled in a mini-golf match with the titular Green King. Along the course, she learns much about him and how he has been reduced to his current state of despair. Mug, conversely, is imprisoned and does not see much action. Still, with his interactions with his jailers and a couple of key flashbacks to the early days of the Order of the Mages, things get put into a different context. At the end of the book, when the two are reunited (spoiler- I guess), they compare notes and what they have observed and come to the conclusion that things they have taken for granted might be very much up for contest. Something about the Order stinks, and in the next book a whole lot of shoes are going to drop. One of the best things about these books is their size, big enough to feature the gorgeous artwork and invite repeated rereadings to see all the detail and Easter eggs strewn about. Personally, it will kill me that I have to wait a year for the next, final book in the series. It is consistently phenomenal. 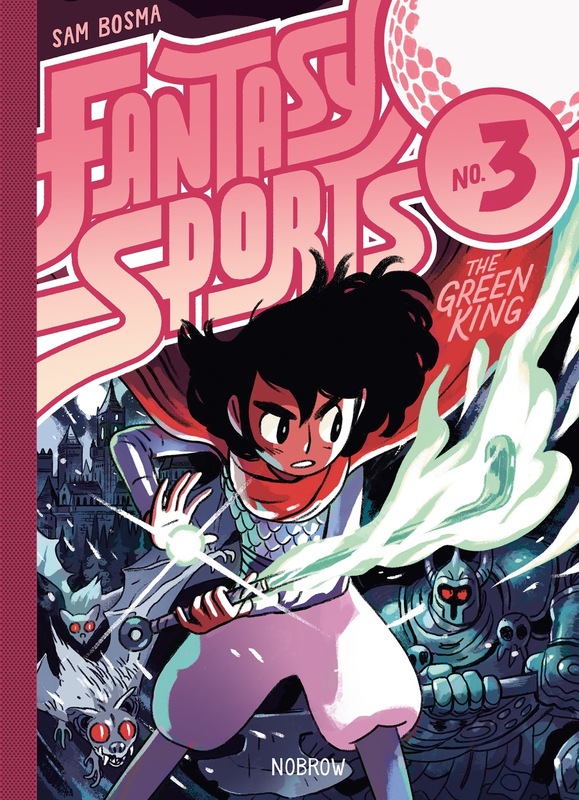 If you love great comics, fantastic character designs, action, intrigue, humor, and a dash of sports, this series is for you. All of the reviews I have read about this book have been very positive. Kirkus Reviews called it "A hole-in-one," adding, "This slim, oversized volume is fast and furious fun, mixing fantasy and sports in a distinct and refreshing way." Stephanie Cooke wrote, "There are plenty of great indie and small press books out there, but few are as beautiful and as fully realized as Fantasy Sports." Antony Esmond opined, "The energy of this series is off the scale and after one read I’ll guarantee that you’ll head back to see what Easter Eggs you missed." 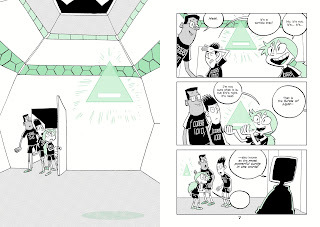 Fantasy Sports Number 3 was published by Nobrow Press, and they have a preview and more information available here. There is also a video preview available here. I have to admit something, I have not read Mighty Jack, the book that immediately precedes this one. After reading this volume though, I feel I need to remedy that situation pretty soon. This second book in a series is fantastic, full of action, adventure, and suspense, and all done in a playful and thoughtful manner. 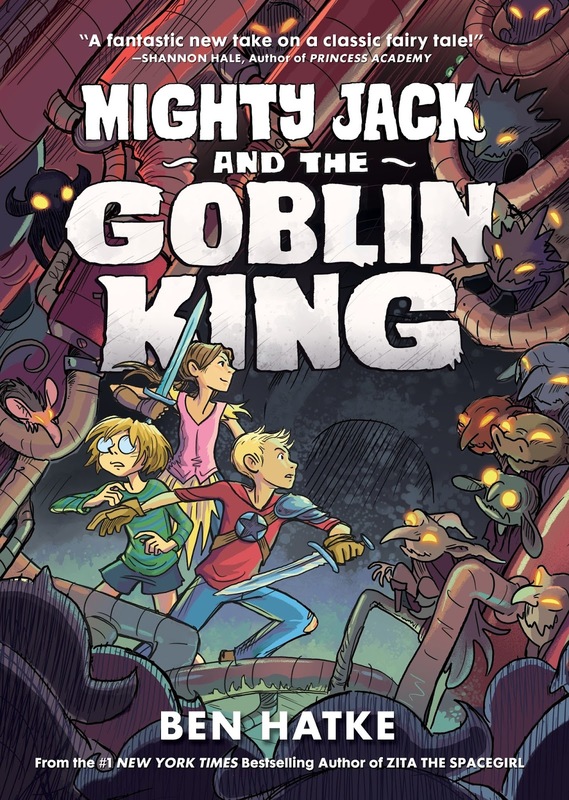 The premise here is a take-off on the classic Jack and the Beanstalk tale, only now is prodded on to rescue his autistic little sister Maddy, who was kidnapped by an ogre through a portal into a floating world full of fantastic, gruesome creatures. Magic beans were involved in all of this, of course. And although the title of the book only features Jack, he is not alone on his journey. His partner-in-quest Lilly is no shrinking violet. The two of them contend with adversity and injury along the way. And when they get separated Lilly finds herself face to face with the Goblin King, a conflict which takes her to a surprising place. Even though I did not have the prior book, at no time did I really feel lost or uninformed. The story started midstream and caught me up to speed in no time. I was also thrilled and moved by the stakes at hand and the stamina and fortitude the human protagonists display. Plus, the book ends in a way that completes this story but also opens up a huge avenue for further adventures. Put simply, this book is breathtakingly awesome. This book's creator Ben Hatke is a graphic novelist and artist known for his Zita the Spacegirl trilogy, the graphic novel Little Robot, and the picture book Julia’s House for Lost Creatures. His artwork is usually simple and expressive, and I feel it very pleasing and fun. In this book his art got more detailed in a way that made things more dynamic though still as enjoyable. All the reviews I have read of this book have been full of praise. Kirkus Reviews gave it a starred reviewed and summed it up as "Another outstanding adventure from a master storyteller." Dustin Cabeal wrote, "Hatke can write serious moments, fun and exciting adventures and still keep a perfect pace while telling the story." Trisha Jenn Loehr called both Mighty Jack books "absolutely stunning." 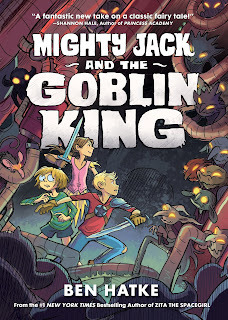 Mighty Jack and the Goblin King was published by First Second, and they offer a preview and much more here.